On martes, I completed my first “blue market” transaction since arriving in the country. 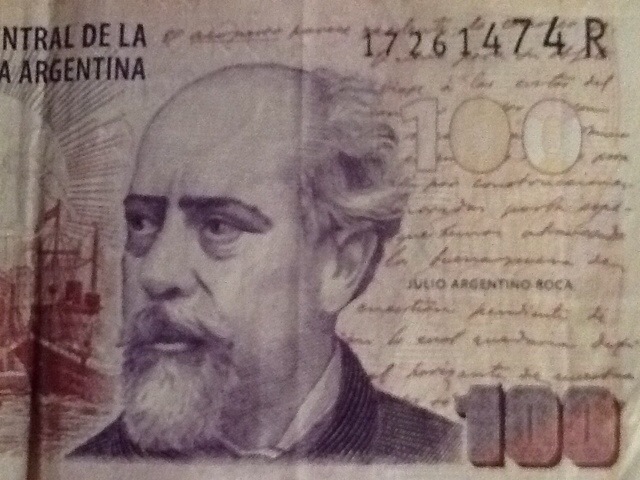 Most of the advice I read before coming to Argentina suggested bringing US$, and exchanging for Argentine pesos once on the ground. Banks, here and in Canada, and credit cards will exchange at about 7 pesos/US$ which is a hefty discount from the official rate of about 8 pesos/US$, and charge fees on top. Due to the Argentine government’s exchange controls, residents who need US$ are willing to pay more, currently 10-11 pesos/US$. The local newspapers provide daily updates of the official “green” rate, and the informal “blue” rate. What I missed was the caveat that the cambios where you can do these quasi-legal transactions are closed on Sundays and holidays. Remember, we arrived late in the day on Saturday of a long weekend. So on the weekend we had no choice but to accept the crappy bank rate. But no longer. On Tuesday after class I swapped US$200 for 2,120 pesos (that’s 10.6 pesos/US$). The cambio was recommended by the owner of our apartment and is just a small space among the shops on one of the major shopping streets in Palermo (our neighbourhood). Apparently it is important to find a reliable cambio to avoid being given counterfeit 50 and 100 peso notes. Two guys in their late 20’s sit behind metal grates and take your US$ and give it to an older guy, who disappears behind a door. A few seconds later, he returns with your pesos and they are passed through the grate to you. That’s it, you’re done. No fees, as the profit is built into the price. No receipts, as this isn’t, technically, legal, but everyone does it. With the difference in rates, I’m not surprised. We didn’t hear a thing. Way to fight The Man, Dad. IDK Curt. Thinking about being shortchanged I guess, or given counterfeit pesos, or having my pockets picked again after leaving the cambio. So many things that normally wouldn’t cross my mind. And there was a cop (of some description) standing on the sidewalk just outside. The Argentine gov’t is running out of US$ and at some point they might decide to “discourage” exchanges at the unofficial rate. Wanting to learn about these things, and the motivations behind them, was part of what motivated me to come to Argentina.